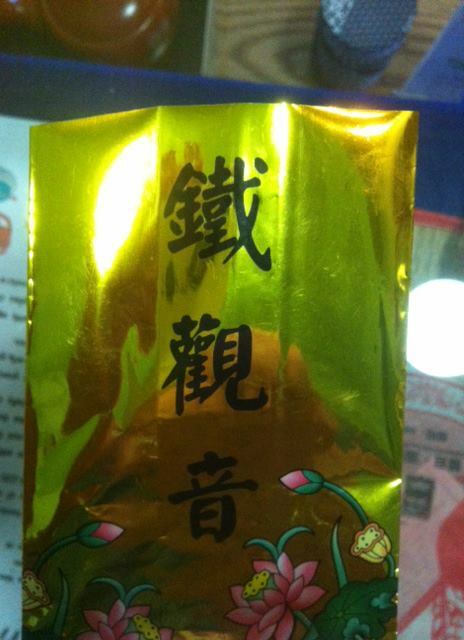 The mysterious bag of Chinese tea. A friend of mine stopped by the tea bar the other day. Unlike most tea bar visits from friends, Wanda brought tea in with her. It was a bag of tea from China that a friend had given her. She didn’t know what it was, and she’d had it for five years, so she asked if I’d like to have it. I cut the bag open and poured out a bit of the tea. It was full rolled leaves; not rolled tightly into balls like Dragon Tears or gunpowder tea, but pretty dense nonetheless. The leaves were hard; dropping them into bowl made a pinging sound. The color was a bit darker than a typical green tea, and the smell reminded me of the Huang Jin Gui oolong we carry at the tea bar. I brewed a cup — using a bit more tea than I usually would because of the age — and decided it was definitely a oolong, but I couldn’t quite identify it. Good packaging, by the way. Five years old, and it still tasted good. Here’s where Facebook comes in handy. I took a picture of the large print on the top of the bag (the photo that’s now on this page), posted it on Facebook, and asked if anyone could identify it. Within about 20 minutes, I had my answer: Iron Goddess of Mercy, a lightly oxidized oolong with a unique aroma. After enjoying it for a few days, I started hunting for a good one to carry at the tea bar, and I’m excited to have a fresh batch coming in next week. Given how good the five-year-old stuff at home is, I have a feeling I’m really going to love the fresh tea. Iron Goddess of Mercy (called “Tae Guan Yin” in Chinese) originated in Anxi, in the Fujian province of China. Today, it is produced in quite a few other areas of China and Taiway. The one we sell at our tea bar is a medium-roasted variety from Nantou, Taiwan. I’ve used the leaves for three infusions without loss of flavor, and I’ve been told they’re good for as many as seven. There are several conflicting legends regarding the origin of Iron Goddess of Mercy, all recounted on the Chinese Tea Culture site. Personally, I much prefer the Wei Yin legend. I don’t know that it has any more veracity, but it’s a better story. Posted on 29 March 2012, in Styles & Blends and tagged China, Dragon Tears, Facebook, gunpowder tea, Huang Jin Gui, Iron Goddess of Mercy, oolong, Tae Guan Yin, Taiwan, TieGuanYin. Bookmark the permalink. Leave a comment.